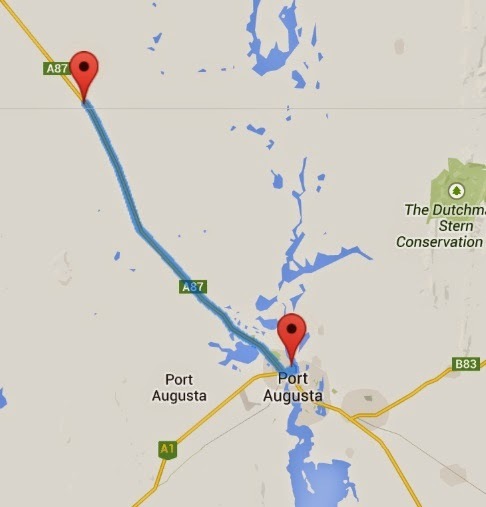 It was such a good decision to not cycle the full way to Port Augusta yesterday afternoon with the traffic building up ... as this morning there was hardly any traffic for us going into Port Augusta! Can you spot something different in this photo? yes that is Neil carrying Koutas trailer in front! We decided to make a change for a while - I am over Koutas movement at the back of the bike! We got to the edge of town at 10am and I felt it was a little too early for the caravan park so we had a cuppa at the Arid Botanical Gardens ... Neil was not impressed with these gardens as he mumbled something along the lines that he just spent the last 2000km looking at this sort of stuff ... it is nothing special! Whereas I thought it was nice as it had a view of the Ranges as the backdrop. 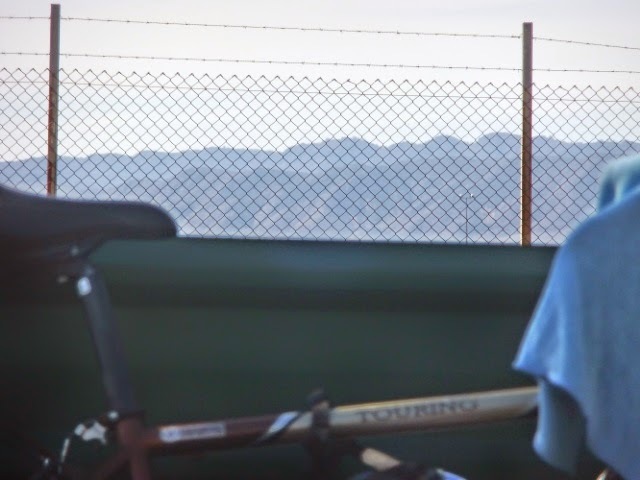 I have to sit up straight in my chair, look between my seat and handle bars and peer over a small fence to get this glimpse ... even if it is through barbed wire fencing ... it is better than nothing!!! 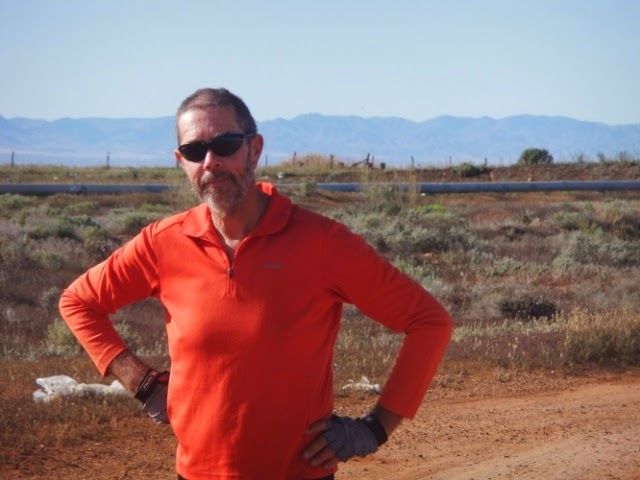 Neil has pointed out to me that we just completed a Trans Continental Crossing - similar to that of Burke and Wills - but I point out that we didn't quite leave from Karumba, we left from Normanton further down the road ... nevertheless he is adamant that it is close enough to be called a Continental Crossing from North to South! 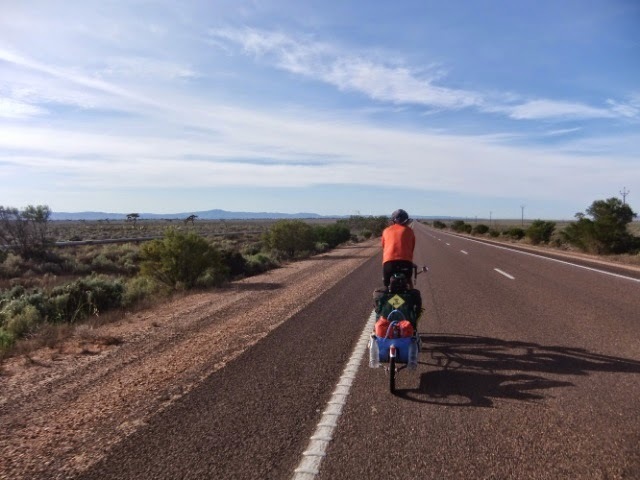 we will stay here tomorrow and restock on food an then catch the northerlies down to Peterborough - we have to climb over some part of these ranges on our first day out of Port Augusta! It is looking like we won't be having our south westerlies to Broken Hill!